Trinity College, Cambridge. Photo by Phyllis Weliver. March 2018. It's a pleasure and a privilege to lunch at Trinity College, Cambridge, but last week was especially noteworthy. In addition to the large historic portraits that usually grace the Great Hall – oil paintings of the great men of Trinity's past –there was a long wall dedicated to photographs of present female fellows. This exhibit of 40 years of women at Trinity opened to the public on 26 June 2018. Earlier this year, I was struck by a similar exhibit in the dining hall of St Catharine's College, Cambridge. Current students organized a dinner in celebration of International Women's Day and covered the paintings depicting men with specially commissioned art celebrating women in College. I wasn't prepared for how I would feel... It is so unusual to see a room full of women's portraiture. Seeing Trinity's photographs reminds me of how this college played an important role in Mary Gladstone's developing ideas about women's suffrage. I'm thinking about when Parliament debated the Third Reform Act of 1884, which proposed that the vote be extended beyond men who paid at least £10/annum in rent or who owned certain amounts of property. The women's campaign made an appeal to include women in this franchise reform. In 1884, Mary was one of the prime ministerial private secretaries (probably the first woman to hold this position), and she had additional clout as Prime Minister Gladstone's daughter. The importance of Oxbridge socializing for Mary's evolving ideas and interventions cannot be underestimated. When Mary travelled to Cambridge in March 1884 to hear a lecture given by the American economist, Henry George, she must also have expected, as usual, a flurry of socializing and bilateral conversation with leading thinkers of the day. But on this occasion, there was a rather strange exchange with James Stuart, a Fellow of Trinity College, Professor of Mechanism and Applied Mechanics at Cambridge University, and Liberal MP for Hackney. A little context may be useful before continuing. J.S. Mill's On Liberty (1859) makes clear that a central part of traditional liberalism is the belief in 'the liberty of thought and discussion', as Mill titles his second chapter. For Mill, debating opinions leads to truth – either sharpening one's own point of view through countering criticism, or becoming convinced of an error in one's own reasoning. The Gladstones believed in this approach, and the family patriarch encouraged all of his children to check him with the cry, 'A lie! ', which caused unfailing amusement at home [Mary Gladstone, Catherine Gladstone (London: Nisbet, 1919), 263]. — Mary Gladstone, 9 March 1884, Diary, Add MS 46261, ff 39r–v, British Library [hereafter BL]. '[N]ationalising the land' had to do with raising money to help the working classes who had been adversely impacted by industrialization – a position that George puts forward in his book, Progress and Poverty: An Inquiry into the Cause of Industrial Depressions and of Increase of Want with Increase of Wealth: The Remedy (1879). There were multiple, factional positions regarding land ownership in the 1880s, including burgeoning socialist ideas – but it would be a mistake to equate George's position with socialism. The topic was simply hotly debated at the time, and there were various standpoints. The prime minister's daughter had previously studied Progress and Poverty, which she understood as ‘supposed to be the most upsetting revolutionary book of the age.’ Furthermore, she had discussed it at length with others, including Prof. Stuart. ‘At present he + I both agree with it, + most brilliantly written it is', she had written seven months before. (Mary Gladstone, 17 August 1883, Diary, BL Add MS 46261, f 20v.) Mary was thus informed on the topic. On the present occasion, her inability to debate with Prof. Stuart was highly unusual. She clearly expected to join in and was embarrassed by Stuart's unorthodox treatment of her 'desperate ventures'. The rest of the company 'sat mum throughout', including her sister, Helen (then Vice Principal of Newnham College, Cambridge) and 'the ungainly son of George' (Mary Gladstone, 9 March 1884, Diary, BL Add MS 46261, f 39v). But on the walk to Trinity College chapel, Mary had her chance to talk with George and treasured his obvious respect. 'Mem.' (remember), she wrote in her journal: 'George's shake hands with M.G. [Mary Gladstone]' (ibid., 39v). For a woman used to meeting the most illustrious people of the day, this memorandum is a significant indication of her high regard for George. Josephine Butler by George Frederic Watts. Oil on canvas, 1895. NPG 2194. © National Portrait Gallery, London. License. — Mary Gladstone, 10 March 1884, Diary, BL Add MS 46261, ff 39v–40r. Helen Gladstone, by Herbert Rose Barraud, published by Eglington & Co. Carbon print, published 1893, 9 7/8 in. x 7 1/4 in. (250 mm x 185 mm) image size. Given by Henry C. Burland, 1986. Photographs Collection. NPG Ax27646. License. Previous to this Monday dinner, Prof. Stuart had prepared Mary by taking her to Trinity where, in Mary's words, he 'read me a paper of Mrs Butler's, most striking + moving.' (Ibid., f 39v.) How interesting that Trinity College's rooms and its Great Hall provided the space for an introduction to Josephine Butler's ideas and person. This was a period when only men had full membership in Trinity College and the larger University of Cambridge. Young women could study at Newnham and Girton colleges and sit University examinations by 1884, but with clear limits. Just six years later Philippa Garrett Fawcett (daughter of suffragist Millicent Fawcett) would score the highest marks on the Mathematical Tripos at Cambridge (by 13%), but she was not awarded the coveted title of Senior Wrangler, nor did she receive a degree from the University. In fact, women could not vote in Britain until 1918 (and then only some women), receive University of Cambridge degrees until 1948, or join the Oxford and Cambridge club in London until 1996. Yes, that’s right … I said 1996. But the picture was more complicated than simple exclusion of women from university rights, as the case of Mary Gladstone reveals. 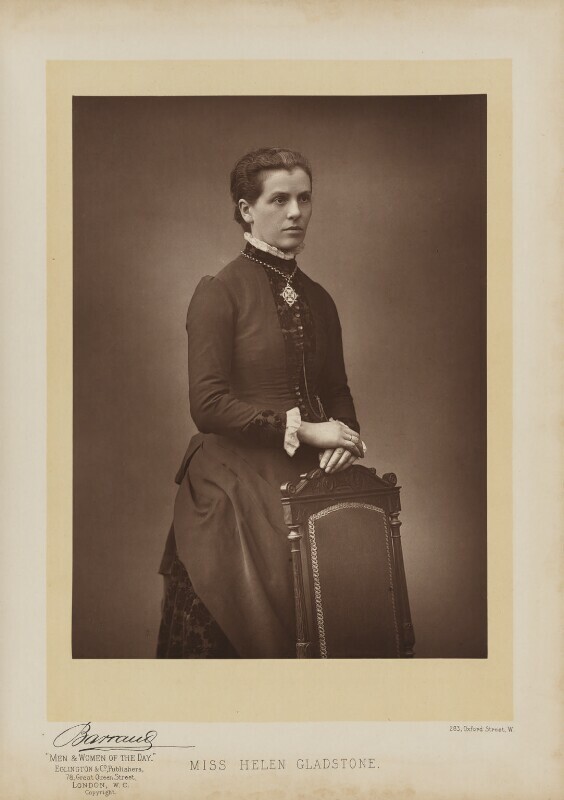 By the time that Newnham and Girton were established, Mary was considered too old to attend (she was born in 1847). Still, here she was at the center of exciting economic conversations, having a kind of tutorial with Stuart on Butler's ideas and then conversing with the Josephine Butler at high table. And how interesting that Henry George was 'much interested' to meet Mary's sister, the Vice Principal of Newnham. With the burning issues of the day interweaving like this, no wonder Mary found herself 'much exercised in mind about many things' (ibid.) on this dynamic visit to the university in the Fens. The handshake between herself and George symbolizes the mutuality of the mixed-gender exchange between individuals. Cambridge socializing provided an opportunity for meeting people beyond Mary's usual circle and for discussions that could impact parliamentary decisions. While we may expect Oxbridge exchanges to become part of the national conversation, it's fascinating to trace exactly how this happened within the nation’s first family, and to realize that, in this case, a daughter was responsible for transferring the information. On Tuesday, Mary left Cambridge for 10 Downing Street where she found her father ill with a cold. Mary waited twenty-four hours and then made a concentrated attempt to influence the Prime Minister. Her diary records, 'tea with Papa in his bedroom, tackled him on female suffrage + nationalization of land_' (12 March 1884, Add MS 46261, f 40r, BL). Just imagine: Gladstone abed in the sick room, feeling poorly, and Mary 'tackle[s] him' (it's a strong verb). I can't help but smile at the mental picture. Mary takes advantage of family intimacy to discuss concerns that were, perhaps, more in line with her role in the private secretariat. Given the amount of time that Mary spent on economics during her visit to Cambridge, it is striking that she included women’s representation in her tête-à-tête with Gladstone. Not all prominent women at the time agreed that it was desirable for women have a legal voice. Mary was ultimately unsuccessful in terms of influencing the Third Reform Bill, but the larger point is that Victorian women with family or friends at Oxbridge were often respected and dynamic participants in the exchange of ideas. By travelling between the universities and elite political London, women facilitated the exchange of knowledge between bastions of power. The visual representation of women in Cambridge great halls has thus been a very long time in coming, for women have been vibrant presences in Cambridge for much longer than forty years. I can't resist a nod to Henry James by way of conclusion: The portraits of the ladies are very welcome, indeed. Read more in Mary Gladstone and the Victorian Salon: Music, Literature, Liberalism.